That’s both good and bad news. It’s good that technological advancements and increased funding are stimulating new lines of inquiry, but bad that researchers are still in disagreement about the etiology and treatment of the disease. But, neuroscientists Frank Rice and Phillip Albreacht disagree. 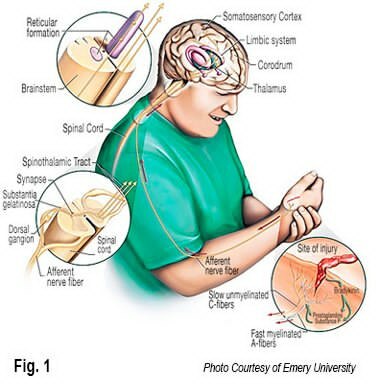 “Instead of being in the brain, the pathology results from excessive sensory nerve fibers embedded around specialized blood vessels located in the palms of the hands and feet.” In this scenario, blood vessels act as shunts, helping to speed blood flow and regulate body temperature. (Fig. 2). 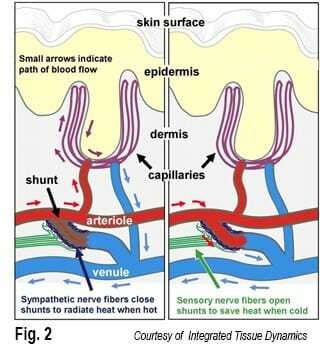 Much like a car’s radiator during warm conditions, the shunts close down forcing blood into the capillaries at the skin’s surface. This radiates heat from the body causing, among other things, the hands to get sweaty. Conversely, to conserve energy as temperatures drop, the shunts open wide allowing blood to bypass the capillaries and we reach for our gloves. They believe that increased activity of the nerve fibers in cold weather explains why fibromyalgia sufferers often experience more pain during chilly times. 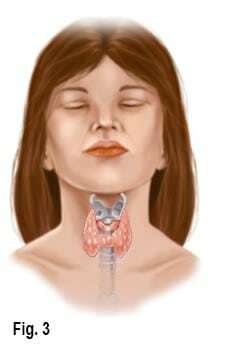 Adding to the confusion Dr. John Lowe, Diplomat of the American Academy of Pain Management and Director of Research at the Fibromyalgia Research Foundation claims “indisputable proof” that the primary cause of fibromyalgia resides in malfunctioning of the thyroid gland and hypothalamus (Fig. 3). His group believes that poor diet, lack of physical fitness, and metabolism slowing drugs are primary contributors to symptoms resulting in hormonal imbalances of cortisol, estrogen and progesterone, which comprise immune system functioning. Rheumatologist Richard Chou agrees that there is some preliminary evidence that the nerve damage is caused by the immune system. “We’re hoping some day we’ll be able to say exactly how the immune system is causing damage to the sensory nerves that results in fibromyalgia pain,” says Chou, an assistant professor at the Geisel School of Medicine at Dartmouth in New Hampshire. Researchers don’t yet know whether the pain causes the other problems of fibromyalgia such as disturbed sleep, or whether both pain and sleep disturbances share the same cause.” Bottom line: the fibromyalgia puzzle has yet to be solved. As with many chronic diseases, the symptoms of fibromyalgia often wax and wane. Therefore, pain management therapy should be considered as an ongoing process, rather than management of a single episode. Flare-ups often exacerbate the client’s underlying stress. Furthermore, stress can also precipitate flare-ups of fibromyalgia. In my opinion, the first line of defense for relieving basic fibromyalgic symptoms should be body therapy and exercise. Although pain from this condition primarily manifests in specifically designated areas, the trained manual therapist must refrain from chasing the pain and instead, seek to restore whole body function by testing for ART: asymmetry; restriction of motion; and tissue texture abnormality. Tissue texture abnormalities must be closely evaluated in clients presenting with fibromyalgic symptoms. Boggy, leathery, fibrotic, contractured, and spasmodic tissues are potential pain generators, with each requiring a uniquely different hands-on approach. But, any soft tissue technique that calms central nervous system hyperactivity and lowers sympathetic tone will provide benefit to those suffering FMS. While it is tempting for the client to relax and not move joints and muscles that are hurting, moving them is one of the best preventive and curative measures found so far to alleviate the painful symptoms. Traditional massage techniques are helpful in desensitizing hyperexcited cutaneous (skin and fascial) neuroreceptors. However, slow-paced deep-tissue techniques that incorporate active client movements (enhancers) add additional therapeutic power by calming pain generating articular (joint) receptors. Intrinsic muscles and joints are inseparable; what affects one always affects the other. Therefore, a more holistic approach to treating fibromyalgia and myofascial pain syndromes should include soft-tissue techniques that create extensibility in contractured tissues and tone in neurologically weak muscles and supporting connective tissues. Incrementally, the more exercise clients are able to do, the better will feel. It doesn’t matter what kind of aerobic exercise — swimming, biking, jogging, walking, dancing — as long as they hit their target heart rate for at least 20 minutes a day. Some report feeling better as they gradually increase their exercise program to 30 minutes, while others have trouble even getting out of bed in the morning. 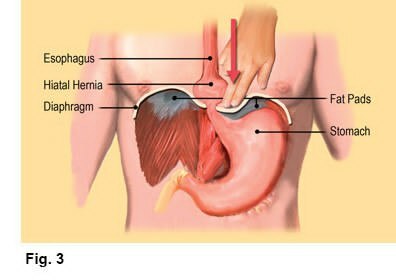 Why do many clients suffering FMS report feeling better when following a vigorous supervised exercise program? One notion suggested is that aerobic exercise beefs up the body’s supply of endorphins, a natural pain dampening and sleep-deepening substance. Exercise increases levels of serotonin and growth hormones, the exact pain reducing, muscle-repair hormones that people with fibromyalgia may lack. Exercise also increases blood flow to the muscles, which may support Rice and Albreacht’s research findings. As additional research rolls in and causality is eventually decided, it is in the client’s best interest to immediately begin routinely scheduled bodywork sessions in conjunction with a specialized exercise regime… regardless of origin. Well structured manual therapy sessions and individualized rehabilitation programs appear to be the treatment of choice for this chronic and sometimes disabling condition that affects an estimated 10 million Americans each year.